More than once I have heard the phrase, “these kids are just lazy and not motivated anymore”. In fact, I have said that very phrase out loud a few times and thought it dozens more. Classrooms are often filled with children not interested in what is being taught and completely disengaged from the learning taking place. It is very easy to come to a conclusion that “kids these days” are just not interested or motivated to learn. However, that could not be further from the truth. In fact, I would argue kids are actually highly engaged and interested in learning, just not what we are teaching. 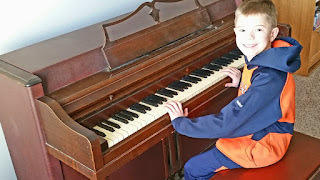 Recently my youngest son has started taking piano lessons. It was something he was interested in doing and we found a local high school student who gave lessons and signed him up. To say he is enjoying it would be an understatement. Every morning before he has brushed his teeth or put on pants, he is down practicing his scales and songs. The moment he gets off the bus, often before his afternoon snack, he is on the piano playing and practicing. He is in love with learning how to play the piano and we’re not even forcing him or asking him to play. My older son obsesses over soccer. He watches it every possible second I will let him turn the television on. He learns about every single player on Arsenal, his current favorite team, and is watching their moves and the the way in which the teams play the game. He is learning everything and anything he can and then goes to the backyard and tries it out. Granted he has picked up some of their dramatic flair and diving abilities, the fact remains that he is learning and loving every minute of it. I watch my sons in both of these instances and many others and know beyond a shadow of a doubt they love learning. Yet, most days when they bring home school work, they don't have that same approach or same attitude. There are occasions when they are doing a project or unit in school which gets them fired up. Those are great days because I don’t have to work so hard to convince them they “need to learn this stuff”. I wish my kids, and all students would have more days in which they come flying off the school bus excited about something they’ve learned at school that day. I'm not going to say kids need to love every single activity and topic they learn in school. But shouldn't they enjoy learning most or at least more of it? Should learning always be a task or a burden on them? This has me reflecting a great deal on the work I do as a history teacher. History is often one of those subjects that you either love or hate. I think it is safe to say the number of those who love it is far less than those who hate it. As a result I'm often trying to find ways to get kids excited and engaged in learning the content of the ancient world. This is a tough job as many students could care less about the impact of the Punic Wars on the development of the Roman Empire and Europe. There are many ways in which we try to hook our students into content and get them engaged. Great teachers use choice, autonomy and fun as ways to do this. Sometimes those things are enough and other times, they fall short. However, I wonder if it is time to move past looking at how we are teaching and evaluate what we are teaching. Yes, I know we are all bound to standards at some level or another. Yet, is there space for schools to create more classes and spaces built completely around student interest and passion? Can we dial back our obsession over higher test scores in reading and math and instead invest in differentiated scheduling and class offerings for kids? Why not take time off class periods or learning blocks and dedicate that time to an elective class built specifically for individual or small groups of students? Can we minimize the amount of district and state mandated assessments and instead create more time for kids to take part in interest based learning activities? What about having students teach classes based on things they are interested in or have a level of expertise in? There are many options and ways in which we can get kids excited about learning in school again beyond just a single day or hour. Everyday I watch my sons playing, reading, or building and I know they love learning. I believe all children have that same love of learning fueled by a natural curiosity. The problem is far too often what the schools are teaching is not in line with those interests or curiosities. While we still need to motivate students to learn content important for their future, we may need to evaluate what we are teaching or possibly our allocation of time. In doing so we could be providing more space and opportunities to spark the learning flame that is far too often extinguished in school.